Harrogate RUFC got themselves back on track with a home win over Lymm at the Stratstone Stadium. 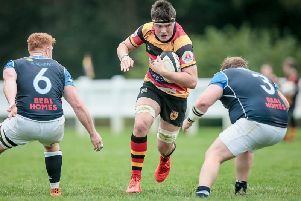 Plagued by injury, Dave Doherty's team had suffered back-to-back defeats in their previous two North Premier outings but ran out comfortable victors on Saturday, prevailing by a 19-7 scoreline in difficult conditions. After an even opening, a thunderous Charley Purkiss-McEndoo tackle halted a Lymm attack, while 'Gate's superior scrummaging quickly led to the visitors opting for lines-out whenever possible. 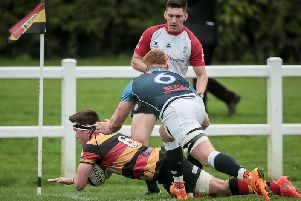 They couldn't prevent a Jonny Coser steal at a 10th-minute line-out, however, and when the hosts were subsequently awarded a penalty, the ball was kicked to the corner. A good catch-and-drive followed, prop Purkiss-McEndoo powering over to open the scoring with Cail Cookland converting from out wide. Purkiss-McEndoo's fellow prop, Connor Ward then extended the home advantage. A promising Harry Barnard break was eventually checked, but 'Gate regained possession at the breakdown and, festooned with defenders, Ward trundled over for another converted score. Harrogate’s forward control was the feature of the rest of the opening half. Steve Maycock, Purkiss McEndoo - back at Rudding Lane on a month's loan deal from Darlington Mowden Park - and Ward dominated front row exchanges with Sam Brady, James Millington and Coser ruling the lines-out and making the pack an effective, workmanlike unit. Shortly after the re-start, an astute Danny Matthews kick through led to a race for the Lymm line. The pacy Barnard outstripped the defence to score in the corner and make it 19-0, putting Doherty's men in full control. A bonus-point win seemed to be on the cards but Lymm stiffened their defence during the final half an hour and gained enough possession to make the remainder of the match a serious contest. A big Maycock tackle checked an away attack, but they regained possession and winger Richard Halford sprinted through for a try, converted by Cormac Nolan. Stung by this setback, Harrogate mounted further raids and, in the last move of the match, Doherty found space on the left flank with a mere 60 between him and the try-line. He didn't quite make it over the whitewash to earn his team a deserved bonus point, however, and the final whistle sounded soon afterwards. Next up for 'Gate is the short trip to Ilkley this Saturday, 2pm kick-off.